type employee = name, address, town, department. These two instances are conflicting with the principle of convertibility, but are allowed by an equivalent relational model because relational modeling only requires uniqueness of a primary key value. However, readers might not agree, because a father and his son can have the same shown properties. If we want to deal with such possible situations then it is necessary to extend the definition “employee” with properties such as “birth_date” and “function” or “salary” enabling us to make a distinction between the two instances. Types are described by their permanent properties, in particular the properties relevant for the information needs at hand. If a property or attribute is not relevant to all instances of a certain composite type then the data definition must be improved. The definition of object types related to a same real life object as “person” needs not be the same for all organizations; the FBI and CIA have more information needs than a local administration department. type project = starting_date, final_date, budget, managing_employee. Here “project its starting_date” and “project its final_date” are examples of role attributes. type employee = name, address, town, birth_date, department. type department = location, manager_employee. 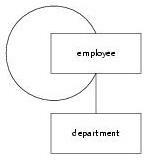 If we want to design a correct data model for employee and department data, a possible solution is to delete the attribute “department its manager_employee” and to introduce the attribute “employee its function”, which is based on a base type “function”. Now an employee can have a function such as “manager”. A consequence of this improved model, however, is that it allows for many managers per department. Later on (see static restrictions) we shall discuss how to restrict (a part of the data definition) the number of managers per department. type employee = name, address, town, birth_date, function, department, supervising_employee. type person = birth_date, mother_person, father_person. The graphical notation of a data model is clearly depicting the dependency between the definition of different composite types: a graphical reference starts in the bottom line of a type rectangular and ends in the top line of that rectangular. For reasons of understandability, abstraction hierarchies do not show the involved base types. Contrary to the Entity-Relationship approach where “vertical” structure is defined through entities, relationships and cardinalities, the semantic approach does not need to use cardinalities: the entity with the “n”-cardinality is placed above the entity having the “1”-cardinality if there is no recursion. Relationships are defined inherently through attributes. This allows us to make a clear distinction between the data belonging to organizations with different ways of organizing labor. type employee = name, address, birth_date, town. type work = employee, department, function, hours. Primary keys may never have the value NULL, but for foreign keys, the NOT NULL rule is not mandatory! The semantic Xplain-DBMS derives the required sub-set contraints from the data model itself. A sub set constraint means that only existing objects may be referred to and that a referenced object may not be deleted. The Xplain-DBMS also offers an interactive way to define data models using a dialogue, which is easier for naive users. type department (I4) = location. type employee (I5) = name, address, town, birth_date, function, department, salary. Contrary to the semantic and the relational model, the Entity-Relationship model is not supplied with a data manipulation language.